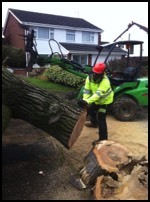 We ensure that all our staff are fully qualified with CPCS, CITB and CSCS (to work on construction sites) and all relevant arboriculture qualifications. We will attend any site inductions/toolbox talks as required. All our teams hold certificates of competence in use of chainsaws (NPTC) and also have relevant qualifications for the use of a chainsaw whilst in a tree as well as tree climbing safety procedures. On every contract there is a fully qualified first aider. We regularly update our LOLER (climbing equipment) regulations certificate and carry public liability insurance to the value of £5,000,000 (5 Million) and employer?s liability of £10,000,000 (10 million). To comply with the CROW ( Countryside Rights Of Way ) Act 2000 we undertake wildlife assessments to ensure that there are no nesting birds or bat roosts before any work commences.